Dentists don't mean to be confusing! Dentists don't mean to use "dentist speak". We sometimes get so enthusiastic that we can forget to make sure you know what we are talking about. Fissure seals or Fissure Sealants are one of the more modern inventions for helping to stop decay. They have absolutely nothing to do with seals that are really cute animals. These are thin layers of clear or white filling materials that are simply stuck on the top of back teeth to stop food getting caught. Generally sealants are only applied to adult or permanent teeth. Usually we need to wait until a tooth is fully erupted before a sealant can be applied. You don't want holes or decay in the top of your back teeth... think about having sealants applied to your back teeth! Because the chewing surface of teeth can be quite difficult to keep clean and often teeth have very fine grooves(fissures) and pits which are too small for toothbrush bristles to reach, dentists have developed a technique of "sealing" these grooves. A blue light is used to set the sealant. It stops food getting stuck into the teeth! BONUS! How long to they last? 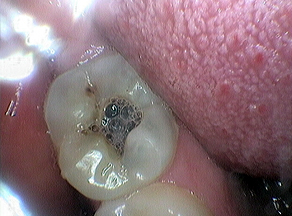 This depends on the condition of the surface of the tooth. Can I use this to stop getting holes in my teeth? This only protects the chewing surface so you can still get decay in other areas of the tooth.